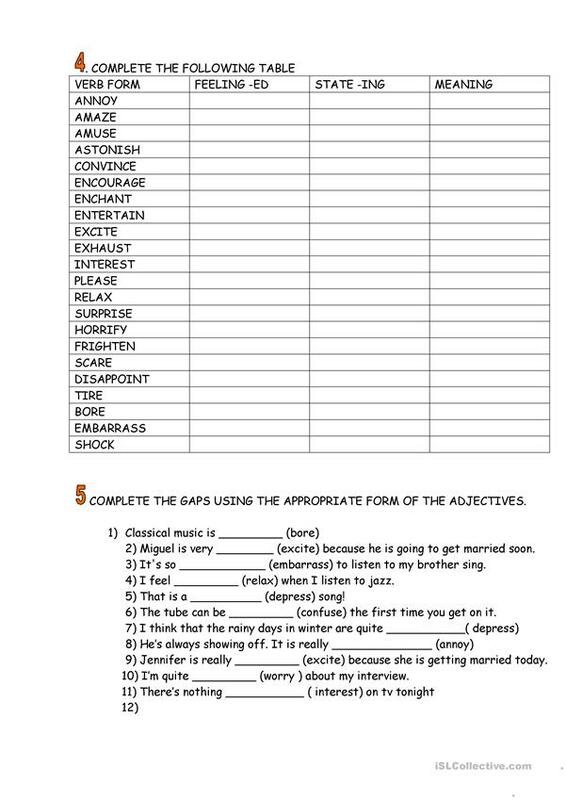 Worksheet about adjectives ending in -ed and -ing. There's an introductory activity to help students differentiate between their use and some more practice to fix the rules. This downloadable teaching material is recommended for high school students and elementary school students at Pre-intermediate (A2) level. It is valuable for teaching Adjectives and Adjectives with –ed or -ing in English, and is useful for working on your class' Reading and Writing skills. It features the vocabulary topic of Describing people. carminski is from/lives in Spain and has been a member of iSLCollective since 2011-01-30 16:35:57. carminski last logged in on 2019-04-12 12:59:02, and has shared 2 resources on iSLCollective so far.